‘Weather’ is the result of a combination of many diverse factors, such as solar radiation, the concentration of greenhouse gases, air quality and humidity, local building density or vegetation, wind direction and a whole host of underlying physical and chemical processes. This makes the drawing up of weather and climate forecasts so complex. The Ruisdael Observatory – named after the 17th-century painter Jacob Ruisdael – will combine a nationwide dense network of measuring points with high-resolution simulations and the necessary computing power in order to map out the changes in local weather, climate and air quality. To this end, on 12 April this new top-quality research facility was awarded one of the ten certificates issued by the National Roadmap for Large-Scale Research Facilities. Long-term greenhouse gas emissions, air pollution and particulate matter have made structural changes to the earth’s atmosphere. We still know far too little about what exactly is happening in the atmosphere and how it is being changed by greenhouse gas emissions. “The great challenge for the atmospheric sciences is to make short-term, local and detailed forecasts as well as predicting what the atmosphere will look like in the future,” says Herman Russchenberg, Professor of Atmospheric Remote Sensing, Director of the TU Delft Climate Institute and initiator of the Ruisdael Observatory. “Our current models work with blocks a few kilometres in size, whereas most atmospheric phenomena occur at a far smaller scale.” So we have to make a lot of assumptions about the state of the atmosphere. To get away from this, we need to measure and model these small-scale phenomena, something that at present we can only do for some sub-processes. Regarding the atmosphere itself, the Ruisdael Observatory will be taking measurements above the Netherlands of such thermodynamic units as temperature, wind and humidity as well as the chemical composition including greenhouse gases such as carbon dioxide and exhaust fumes and emission gases such as nitrogen dioxide, ammonia and sulphur dioxide. These produce aerosols – dust particles – around which cloud droplets can form. The resulting clouds in turn influence radiation. The ground under the atmosphere is also important as soil humidity and temperature also influence the weather. We should really start measuring from a metre underground up to an altitude of around twelve kilometres – in other words the entire troposphere – as this is the layer of the atmosphere that determines our weather and our climate. The Ruisdael Observatory is a partnership made up of a wide range of parties, which enables it to combine all of these individual specialisations. 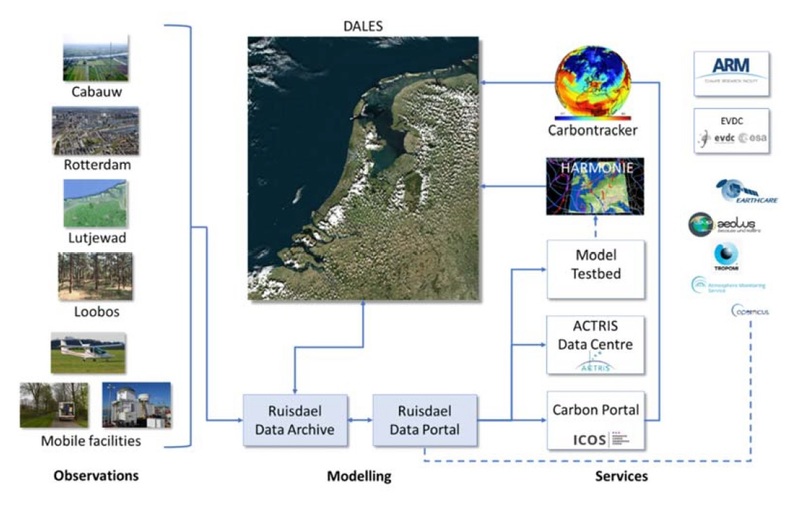 The consortium comprises researchers from the Royal Netherlands Meteorological Institute (KNMI), Utrecht University, the University of Groningen, VU Amsterdam, Wageningen University & Research, RIVM, TNO, ECN and TU Delft (coordinating university). Russchenberg and his colleagues are planning a very dense nationwide network of measuring points, comprising a fixed measuring network, mobile sensors and comprehensive ground stations that will provide data on the physical and chemical properties of the atmosphere and its interaction with the earth’s surface. The modelling aspect suffers from the same problems as the measuring side of things. Although the models are achieving increasingly higher resolution, they are not yet detailed enough. A new computing facility is needed to process the observed data in real time into atmospheric models. The goal of the Ruisdael Observatory is to produce a simulation of the entire atmosphere of the Netherlands at a resolution of 100x100 metres. A major advantage of such a national map of ‘Dutch skies’ is that the Netherlands has a huge variety of different sorts of landscape, building, vegetation and weather conditions packed into a relatively small surface area. This means we can learn a wide range of local lessons about weather and climate, lessons which can also be applied internationally. See the press release of NWO. See this earlier background article on the Ruisdael Observatory: Ruisdael Observatory understanding the future of our atmosphere. Professor Atmospheric Remote Sensing, Herman Russchenberg, h.w.j.russchenberg@tudelft.nl, 015 27 86292. TU Delft Science information officer Roy Meijer, r.e.t.meijer@tudelft.nl, 015 27 81751.